The low-lit halls of the Academy of Natural Sciences are home to mighty bison, musk-ox, sleepy pandas, lions, tigers and yak — all frozen in time and place. Sealed behind glass and posed in perpetuity, they have stood in their life-like dioramas since these exhibits opened in the 1930s. The exhibits were created to expose Americans to scenes of wildlife in far-flung corners of the world that they wouldn’t otherwise be able to see, and they’ve been virtually untouched for 90 years. Until now. 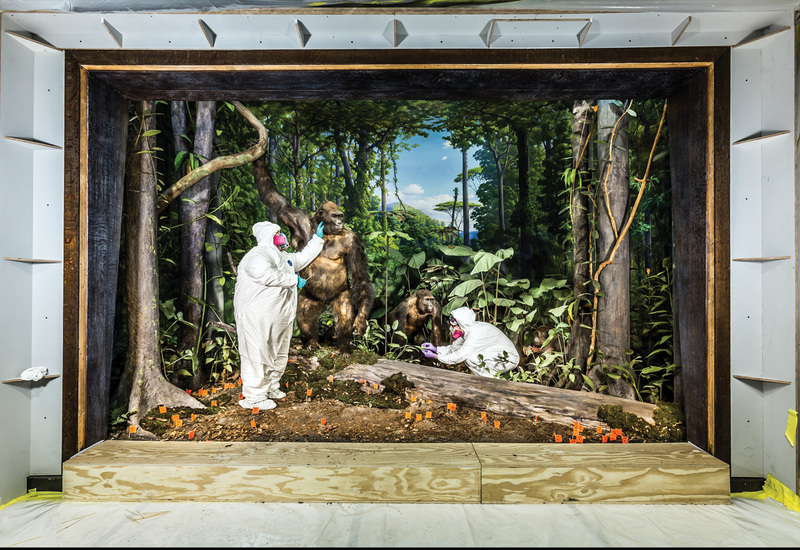 The crew, which consists of George Dante (on the left), a professional taxidermist and president of Wildlife Preservations, and Rachael Arenstein (on the right) of A.M. Art Conservation, are wearing Tyvek suits and respirators as protection against any chemicals that may have been used to preserve the specimens. For most of the past century, toxic preservatives such as arsenic, chromium and mercuric chloride were used to protect organic specimens from infestation and decay. The work area is sealed behind plastic and the air continuously filtered. In addition to restoring the animal skins themselves, the Academy will be installing new lights and labels, repairing the background paintings, clearing away layers of dust and retouching or replacing artificial plants that have begun to sag or fade. These flags mark places where marble berry plants have been removed from the exhibit. Each flag corresponds to a map created by the conservators to indicate where every plant, rock and specimen belongs. The marble berry is a metallic blue fruit often described as the brightest substance in nature, but these had faded to the point of looking like ordinary blueberries. Once their luster has been restored, conservators will consult the map and matching flag to replace each plant to its prior position. The renovated exhibit will be bright and clean — and also more authentic. For example, the swallowtail butterfly perched delicately on this leaf is out of place altogether: You’d never find one in the part of central Africa this scene is meant to depict. Films and photographs of the process and final renovations are viewable on the Academy’s Facebook page @academynaturalsciences.